In India, the highest temperature in summers get as high as 45 degree Celsius, which is pretty extreme. The mercury levels just shoot up in the scorching summers, and the situation calls for some help. In summer, there are risks of several diseases like strokes, heart attacks, dehydration, low pressure, high pressure, indigestion etc. Our body requires extra hydration and hence we should eat the best summer fruits and vegetables and drink plenty of water to keep the body properly hydrated. In today’s post, I want to discuss about such summer fruits and vegetables, which will help you beat the heat and stay fit and healthy. Summer is the season of water melons, lemons, pomegranates, apples, bananas, cucumber, mangoes, citrus fruits, and other fresh fruits and vegetables. And probably this is the time, when you can get rid of the packaged drinks and make fresh juice with summer fruits and vegetables, at home. Readymade and packaged juice may contain added sugar, artificial colors and preservatives and hence it’s better to make your own juice and smoothies, using freshly sourced summer fruits and vegetables. These fruits and vegetables are soothing to your tongue and also the stomach. Grab these daily and enjoy the sizzling summer with full vigor. Listed below are some of the best summer fruits that you should eat this season. Make smoothies, juice, and salad or eat it in any form you like, but include some of these summer friendly fruits in your daily diet. Corn is rich in lutein and zeaxanthin which acts as a protective shield against the UV rays of the sun. In summer, the sun’s rays are warmer and scorching, and the harmful rays can cause damage to the skin and the eyes. The tow compounds present in the corn will help to prevent some diseases like glaucoma or skin irritations and rashes, and also skin cancers. The corns help in shielding the body, just like the sunglass. You can eat roasted corns, or even the boiled corns are good and helpful for your body and health. Just like cucumber, water melons are rich in water content, as suggested by the name of the fruit. Melons are juicy fruits and highly nutritious and delicious. Some of the important nutrients it has include vitamin C, pantothenic acid, copper, potassium, biotin, magnesium and vitamin B1 and B6. The fruits have minerals and vitamins which will help you to remain fuller and hydrated for long hours. You can make juices and smoothies or just slice and eat it. Calories: 100 grams of watermelon have 30 calories and 8 grams of carbohydrates. The coconut water is as beneficial as drinking water, but it’s tasty is much better than just water. Coconut water is sweet, delicious and highly nutritious. It has natural sugar content which can help in maintaining the sugar content in blood. During summers, there are high chances of dehydration; drinking coconut water can help avoid dehydration. Calories: A glass of coconut water have appro 19 calories and 3.7 grams of carbohydrate in it. Just mix one tablespoon of sugar and one tablespoon of lemon juice in cold water and drink it. It maintains the pH levels of the liver, thus promoting better digestion. This will also help in detoxification as there is lemon in water, it will flush out the toxins from the body. Calories: A glass of lemon water will have 40 calories and 10 grams of Carbohydrates. One medium sized apple will have around 2 grams of fiber which is too healthy. An apple a day is required for you all round the year. Apples are rich in vitamins and minerals which can help you to improve the immune system of your body. Calories: A standard size apple of about 100 grams, will have 52 calories and 14 grams of Carbohydrates. In summer, we are advised to eat light, because if you eat heavily, your body will require more water to digest your food properly. And due to lack of water, you may experience several digestion related issues. 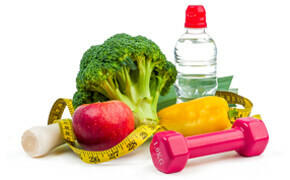 Ideally we should eat nutritious and fresh vegetables rich in vitamins and minerals, mater, fiber and other nutrients. 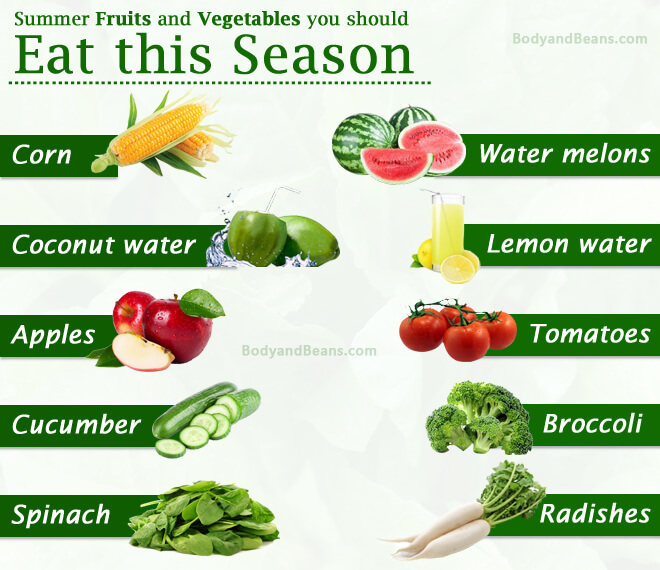 Listed below are some of the most nutritious summer ready vegetables that you should eat to beat the heat. Tomatoes are rich in lycopene which makes them red. This compound forms a protective layer on your skin which shields against sunburn and sun tan. Tomatoes contain water in them, so they help in keeping your body hydrated. Calories: 1 cup of medium sized tomato juice will have 33 calories and 8 grams of Carbohydrates. Cucumber is available throughout the year in India, but there is nothing like eating a cucumber everyday in summer. It contains lots of water which can keep you hydrated. Apart from high water contents, cucumbers also have Phytochemical and other therapeutic properties. Water and fiber are the main ingredients of this vegetable. Cucumber is not only beneficial for hydrating your body, but also removing acne, sun tan, dark spots and blemishes. Eating a cucumber everyday in summer helps detoxify your body and boosts digestion. One of the easiest ways to eat cucumber is to slice it and sprinkle some sea salt and lemon juice to make a quick and simple green salad. Calories: one cup of sliced medium size cucumber will have 16 calories and 4 grams of carbohydrates. The vegetables like spinach, ladies finger, green vegetables like broccoli and bell peppers are nutritious in summer, and also the year round. You can make mixed veg curries, soups, stew, with all the vegetables of your choice and then have a nice tasty meal. Radishes are rich in Vitamin C, and are one of the most nutritious roots vegetable. They are often overlooked, but they provide the relief in summer which your body craves for. The radishes must be hard and firm, do not buy the soft ones. There are various delicious recipes that you can cook with radishes too. Calories: 100 gm of radish will have 16 calories and 3.4 grams of Carbohydrates. Pumpkins have diuretic properties; can help fight the intestinal worms, digestive problems, constipation etc. You can several preparations with pumpkins. Pumpkins are also good for hair growth, and have anti inflammatory properties in them. Calories: 100 grams of pumpkin will have 27 calories and 5 grams of negligible fat. Apart from eating fresh summer friendly fruits and vegetables, there are a few other foods that you should eat in summer season. Foods like fresh curd, green salad, smoothies etc soothes your body and helps you fight the heat easily. Here are some other foods and beverages you should take this summer. It is beneficial for you to have curd daily in your lunch or breakfast. Curd is generally not preferred at night because many people feel uncomfortable due to gassiness. It is better that you mix some chopped fresh fruits in curd and enjoy a nice fruit salads. You can keep this in freezer and then enjoy cool dessert. You can also prepare raita with curd and enjoy it as a side dish. It is very easy to make curd at home with milk, and then consume it fresh. Calories: 100 grams of curd will have 98 calories and 3.4 grams of Carbohydrates. You are already aware of the innumerable benefits of green tea. Green tea helps in fighting and preventing cancer, weight loss, fighting dementia and heart problems, shield against cholesterol and thyroid, etc. In summer, you can add some ice to your green tea and then enjoy a cool summer drink. Calories: one cup of green tea has just about 2 calories. You can enjoy various colourful and tasty salads during the summers, this way you can get the nutrients of various fruits and vegetables at once. You can have mixed fruit salads with some of your favourite foods like apples, peaches, bananas, grapes, cucumbers, etc. You can also enjoy salads like with cucumber, onions, carrots, lettuce, boiled chicken shreds, radishes, beets etc. This can be a healthy meal to beat the heat of the summer season. Waking up in the morning and going out for work is something that has no other solution. Be it excessive hot, or excessive cold, you cannot deviate from the regular activities. But, trying to remain calm in whatever the situation is something we can do. Drink water as much as you can, but avoid chilled water from freezer. I know you prefer chilled water always, but doing so may cause some health issues. When you are on your way to office, you feel thirsty, and you drink chilled water. This is dangerous. When you drink chilled water under the sun, then you face huge difference in temperature (cold water and scorching sun). This distinction in temperature can cause severe headache and also fever. Wear loose clothes for proper air circulation. Wear light color clothes, preferably white or any similar shades. Take proper guard, like umbrella, hats or sunglasses. It’s better if you take black or any dark shade. Have hot drinks, like tea or coffee. I know it sounds weird, but it really helps. Drinking these help in reducing sweating by high percentage. Eats lots of vegetables and fruits. Eating fruits is always better than fruit juice. Apples, apricots, and watermelons can give you comfort in this summer. Consume less quantity of salt in your foods. Use sunscreen lotions before you go out in the sun. Otherwise your skin can get damaged due to this, it may cause heat rashes. The UV rays are very harmful, and can even cause skin cancer. Start taking these foods from today onwards as summer has already arrived. Are you taking these foods daily? What other steps are you taking to beat the heat this summer?